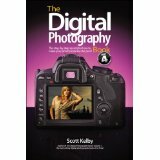 The Digital Photography Book, Volume 4/Scott Kelby, Berkeley: Peachpit Press, 2012, 219 p.
This volume continues the format of the three earlier volumes with each chapter dedicated to a single major subject and composed of a series of one page vignettes that can be read in order or reviewed individually. Like Volumes 2 and 3, Volume 4, picks up where the previous books ended and assumes the reader has either read the previous volumes or has a solid understanding of the tips there. The first three chapters in volume 4 (Shooting People, Using Hot Shoe Flash, and Using Your Studio) concentrate on photographing people, primarily in a studio situation. While I’m sure the tips offered here are excellent, I have little experience to draw on in this area since my principal focus is outdoor and nature photography. Chapter 4 supplements the information provided in Volume 3 on lenses and associated topics. It is followed by chapters on natural light, landscapes, travel, and sports. Two chapters new to this volume cover HDR (High Dynamic Range) photography and digital video. As Kelby indicates most photographers fall into one of two camps – those who love HDR and those who hate HDR. While I have seen some good HDR, my leanings are toward the latter group because most HDR work I have seen is poorly done. Although my camera has video capabilities, I have elected to not pursue this. Continuing previous practices, this volume closes with two chapters covering pro tips and photo recipes, or techniques used to capture selected sample images. These two chapters provide some of the most useful and easiest to read information because you have clear examples of the technique being covered. While Peachpit rates this book as a Beginner Level volume (consistent with the other three volumes), my view is that, like Volume 3 it moves into areas that are for slightly more advanced photographers. Even so, I wouldn’t hesitate recommending the series to any digital photographer. As I noted in my review of volume 2, you can purchase all volumes in the series as a boxed set at with some possible savings. These books are also available in eBook form (for both Kindle and Nook readers).